As more retailers hop on board the NES bandwagon, the displays of consoles, accessories, and Game Paks have become more elaborate. The video game business is booming again and Nintendo is leading the way. It offers retailers a program whereby the store earns merchandising credit for every console and game ordered. This money can then be used to help purchase special displays that will increase sales velocity at the stores. Not only that, but Nintendo has set up plan-o-grams and display standards that really showcase the variety and depth of the entire ecosystem. In the below illustration we can see how a retailer might choose to merchandise its NES video games section. The NES Control Deck is stationed on the bottom shelves with the Game Paks above. On the end of the aisle is an interactive display where kids can try out the NES and a variety of games. Rad Racer is shown in the illustration. Of course Nintendo knows every retailer has varying amounts of space for video games, and so they’ve designed a bunch of different ways to display the system and the games. From a rotating tower called the Game Paks Center to a flip-sheet display that flattens out the boxes, there’s something for every store to consider. These official displays are ordered through the Nintendo representative assigned to each individual store or retail chain. Even upcoming games like Zelda II: The Adventure of Link can be promoted via a counter card to drive anticipation for one of the hottest games of the year. Look what happened to the last guy we boxed. And see how we’ll defend our title next. Since we introduced Mike Tyson’s Punch-Out!! a few months ago, it’s been a knockout seller. Just like The Legend of Zelda and a whole array of arcade hits that scored just as big at home. But software is just part of our winning formula. We’ve also got innovative hardware and a full promotional support program. It all adds up to make Nintendo the undisputed champion of the video game market – Number One in growth, in market share and in offering dynamic new products. And in 1988 we will aggressively defend our title. This season we’re featuring terrific new releases like Zelda II – The Adventure of Link, a fantastic sequel to our first million-seller, The Legend of Zelda. We’ve also got Dragon Warrior, a new entry in our tremendously successful Adventure Series. And that’s not all. We also have one-of-a-kind sports games like our new Pro-Am Racing and Ice Hockey, with a brand of competitive excitement only Nintendo offers. How do we plan to maintain our championship status? With extensive research and development by our in-house software designers, as well as exceptional – and exclusive – third-party software support. (We even put our seal of approval on every game). It’s support that guarantees your customers the largest library of hits anywhere – hits that can only be played on the Nintendo Entertainment System. And we don’t stop there. We also offer ingenious new accessories. Like our NES Advantage, which puts the power of arcade play in your customers’ hands, and the new NES MAX, a compact joypad that offers maximum control and accuracy at turbo speed. It’s all backed by an explosive $40 million promotional effort that includes a massive television campaign, generous co-op support and a far-reaching dealer merchandising program to provide in-store support. Great software. Terrific accessories. Powerful support. It’s the combination that’s made us champs. And it’s going to keep us there. All of which means that only Nintendo can make you a heavyweight in video game sales. More retailer promotional items are shown on the next page. From brochures featuring R.O.B. the robot (something we’re told is now being discontinued) to counter displays for The Legend of Zelda featuring the golden Game Pak, there are plenty of ways to jazz up any retailer’s countertops. We have to admit those Nintendo signs are pretty slick too! Perception rather than logic fuels most buying decisions. In fact, over 70% of all retail purchases are the result of in-store decisions based on a product’s visual appeal. Draw attention to a product with a powerful, eye-catching visual display and watch it move – right off the shelves. That’s how effective merchandising works. Creating the right visual sell for a product is the last important piece in its marketing puzzle – a piece that can have a major impact on your total profit picture. Turn on the power of merchandising with Nintendo’s 1988 Dealer Merchandising Program…and watch your profits light up. Nintendo’s Merchandising Program is your key to greater volume. Once again, Nintendo leads the way with superior merchandising strategies for 1988. As an Authorized Nintendo Dealer, you’ll find our merchandising displays and materials will create a powerful visual presence in your store – stimulating sales for the entire Nintendo Entertainment System product line. Our new Merchandising Accrual Program reflects our commitment to helping you maximize profits with exciting sales tools that motivate your customers to choose Nintendo. THIS ALLOWANCE MAY NOT BE D.F.I. N.O.A. supplied display materials and/or fixtures as presented in the N.O.A. merchandising order form and this catalog. (Specified N.O.A. materials will still be available at no charge). Custom designed in-store displays which have been preapproved by the N.O.A. Regional Manager and the Director of Merchandising. CUSTOM DISPLAYS WILL BE REIMBURSED VIA CHECK FOLLOWING SUBMISSION OF PROOF OF PERFORMANCE (PHOTO REQUIRED) AND COST. The next page of the retail binder shows off what we’ve come to see at bigger chains like Target and K-Mart. A whole aisle of Nintendo goodness with the Game Paks freely hanging on peg hooks and the accessories and systems lining the bottom shelf and overstock on the top shelf. Very often and end cap is set up with an interactive NES for people to play. Some stores choose to have this stuff behind glass for theft reasons, but many larger retail chains simply have the game aisle facing the electronics department register, where there’s usually an employee keeping a close watch. Four million times and counting…We’ve been the player’s choice. We didn’t create the number-one selling home video entertainment system without a lot of experience in knowing what your customers want. After all, video games are our business. That’s why we offer innovative software, hard-working hardware and accessories that put the latest advances in game control right in your customers’ hands. All solid reasons behind the unrivaled success of the Nintendo Entertainment System. In fact, we’re leading the home video game market 3 to 1 over all the competition combined. Simply put: our hardware needs no hard sell. So why carry anything else? An now with the two new system configurations and expanded accessory options, you’ll have new opportunities for tapping the power and profitability of the player’s choice: the Nintendo Entertainment System. Perhaps someone should tell Nintendo that the Action Set won’t play the Robot Series of games? For customers looking for the best value in video game entertainment, there’s the Nintendo Entertainment System Action Set. It comes with everything a family needs for endless hours of fun. Capable of playing our entire library of Game Paks, the Action Set includes the Nintendo Control Deck, two game controllers, the Zapper light gun and a special Double Pak containing two Nintendo game favorites – Duck Hunt and Super Mario Bros. But that’s no the only way to bring home the excitement. Selling individual components like the Nintendo Control Deck and its accessories allows your customers and inexpensive entry into the system that’s the talk of the industry. The binder contains some promotional materials for 1987 as well. 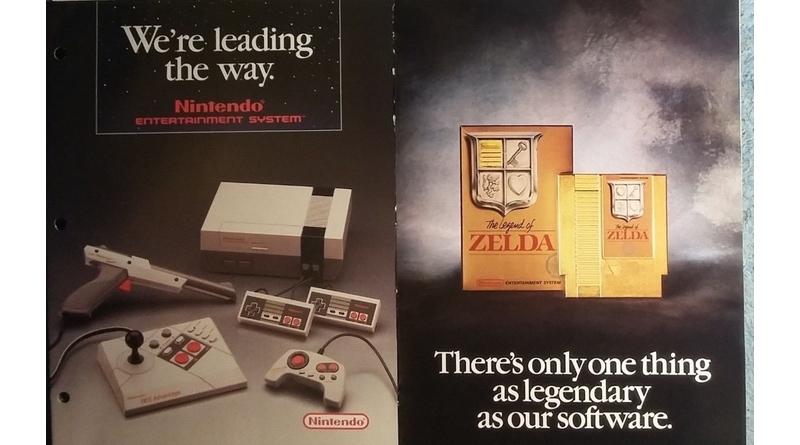 That’s why there are still ads for the NES Deluxe Set as well as talking about games that have since been released. Even the Nintendo Fun Club is promoted and gives details on how customers can sign up. In all, it’s a great inside look into how Nintendo sells its wares to retailers!